Wine tasting = fun, yes? So, what’s even more fun than wine tasting? How about wine tasting + special tours, food, events, open houses, games, and festivities = two great flavor-filled days! 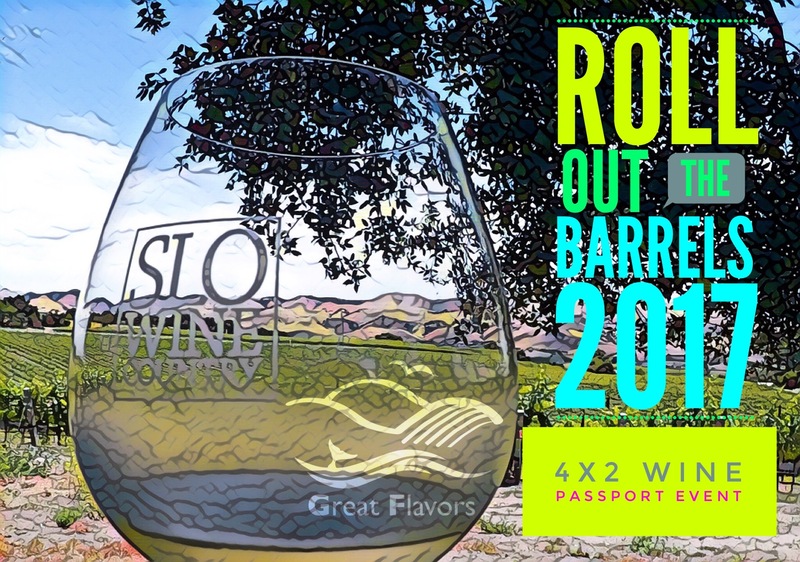 On the Friday and Saturday following Barrels in the Plaza 2017, the 4×2 Passport to SLO Wine Country allows holders to visit four of about 25 participating wineries on both Friday and Saturday, for a total of eight visits. But these two days hold much more than just the normal wine tasting experience. Hmm, so many choices…. 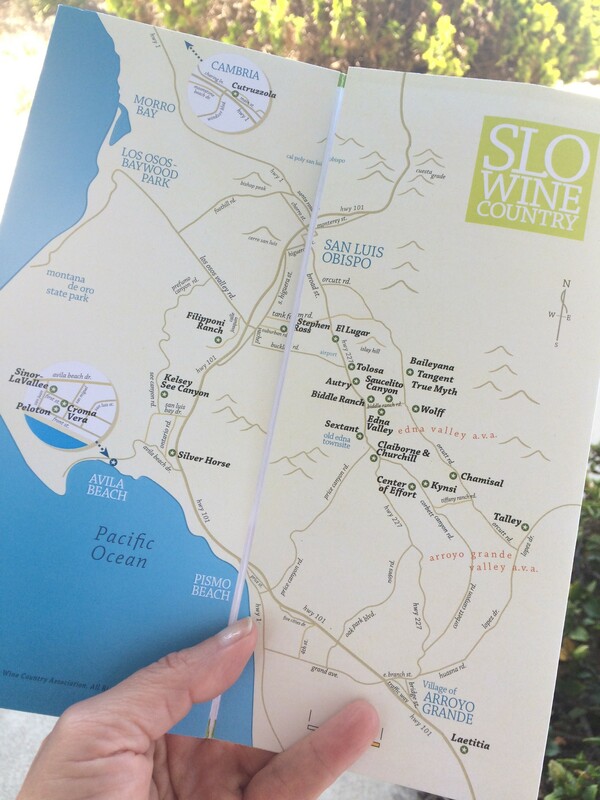 Which stamps will we get in our 4×2 Passport to SLO Wine Country? Each of the wineries involved offers something different or fun. Some offer barrel samples, library, and reserve wines or vertical and horizontal tastings. Others, like Laetitia Vineyard, take visitors on a tour through the vineyard before their tasting. Stephen Ross Wine Cellars helps improve your wine knowledge with the fun Wine Aroma Bar. Some have vino-centered games and prizes, like Peloton Cellars, while two wineries—Kynsi Winery and Wolff Vineyards—bring in rare animals to admire. 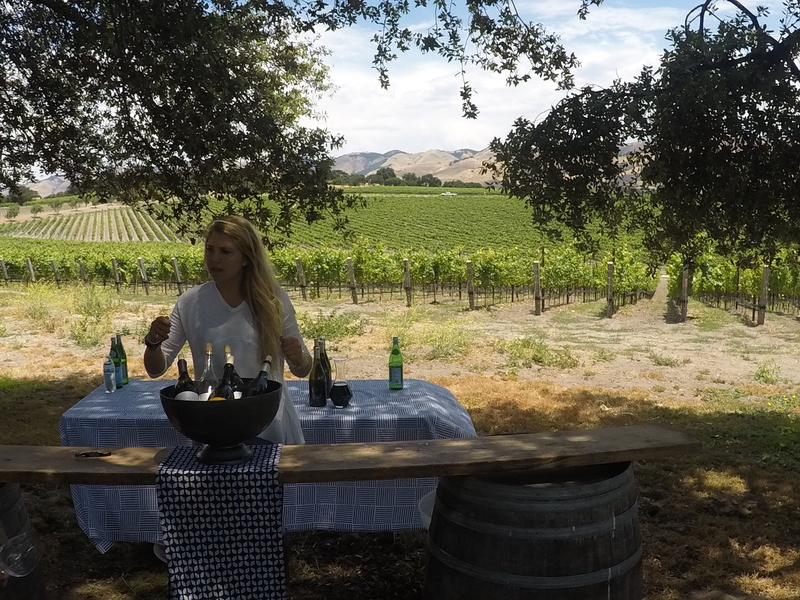 Most wineries provide food, music, and other festivities to round out the Passport experience. When you sign up for the passport, you’ll have your designated starting point winery. This is the first winery you’ll visit to receive your passport, plus your glass and wristband if you didn’t attend Barrels in the Plaza. With so many options, and so little time, the hardest part is choosing which wineries to visit. Because we both work on Friday, we hit it hard on Saturday. Here’s how our day unfolds. Center of Effort’s beautiful view and a lovely spot to sample the 4×2 Passport selections, which end with a 2016 Pinot Noir barrel sample. 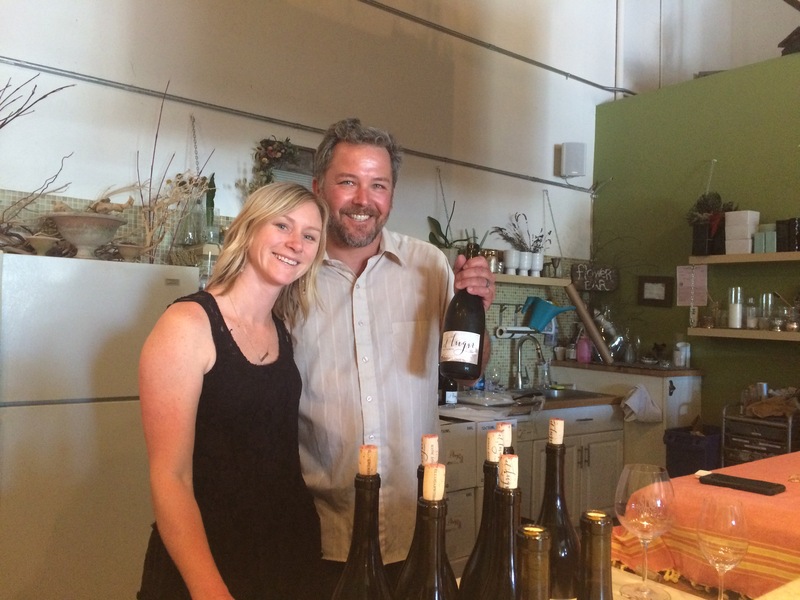 Center of Effort has been on our radar since the Edna Valley Collective Dinner at World of Pinot Noir last spring. The problem is, the winery is open by appointment only and we never seemed to make an appointment. Lucky for us, Center of Effort is on the passport list and it’s also our starting winery. 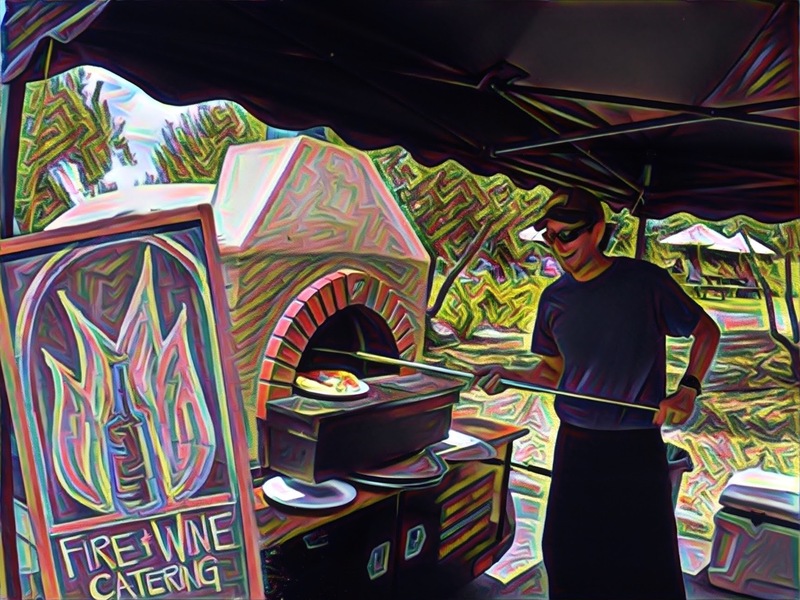 Fire & Wine Catering brick pizza oven on wheels. Fantastic pizza, and gluten-free options, too. More luckiness for us, Fire & Wine Catering is providing free pizza to all passport holders. And not a mere slice. No, an entire personal pizza, hand crafted, baked in their portable brick pizza oven. And the best best best part (from gluten-free Kara’s perspective)? They have gluten-free pizza! And it’s really really really good! Thank you so much, Fire & Wine! But back to the great Center of Effort wines. We start with a Pinot Noir Rose, followed by Chardonnay and Pinot Noir vintages, and end with a barrel sample from their 2016 Pinot Noir. All are very good, and the 2016 Pinot Noir is shaping up to be an excellent wine. Enjoying our pizza with great Pinot Noir while sitting at the picnic tables under the shade trees and looking at beautiful view – a perfect start to the day. From Center of Effort, we can see our next destination. Kynsi Winery is right across the street. We’ve been to Kynsi several times, and an all-time Flavorite is their Hutash red blend. Today, they’re pouring red and white flights, plus 2016 barrel samples. Unfortunately, Hutash is not on the tasting list, but we try a couple very good reds. If we hadn’t been so full from the Fire & Wine pizza, we would have chowed on the great small bites offered by Luna Red. 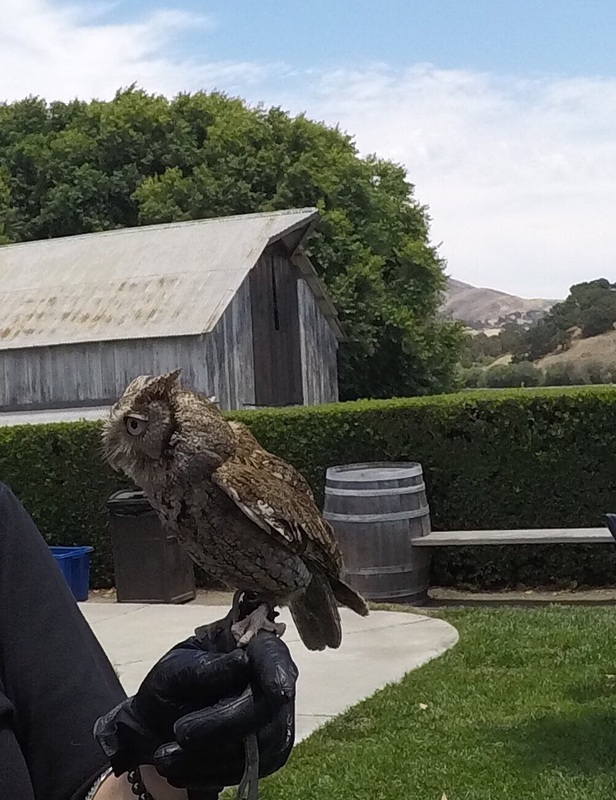 The small but mighty Screech owl is a favorite at Kynsi Winery’s 4×2 Passport event, with the historic barn in the background. While we are fans of Kynsi wines, today’s big draw is seeing the three owls brought by Zoo to You. The diminutive Screech owl is the crowd favorite, and the two larger Barn and Barred owls are majestic. What a treat to see these creatures up close. The majestic Barred owl surveys the crowd at Kynsi. What an experience: to meet two beautiful wolves at Wolff Vineyards. Next, we head a few miles north to Wolff Vineyards. Yes, Wolff Vineyards makes great wine, in addition to being home to Kara’s favorite Teroldego. 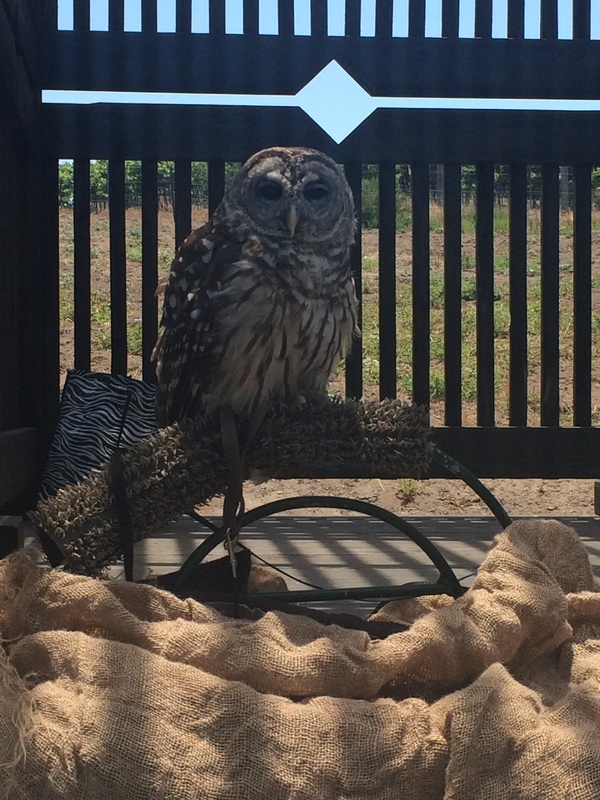 But we choose to visit today because of special guests that will be making an appearance at the winery. The WHAR Wolves organization from Paso Robles is bringing two wolves for visitors to meet! 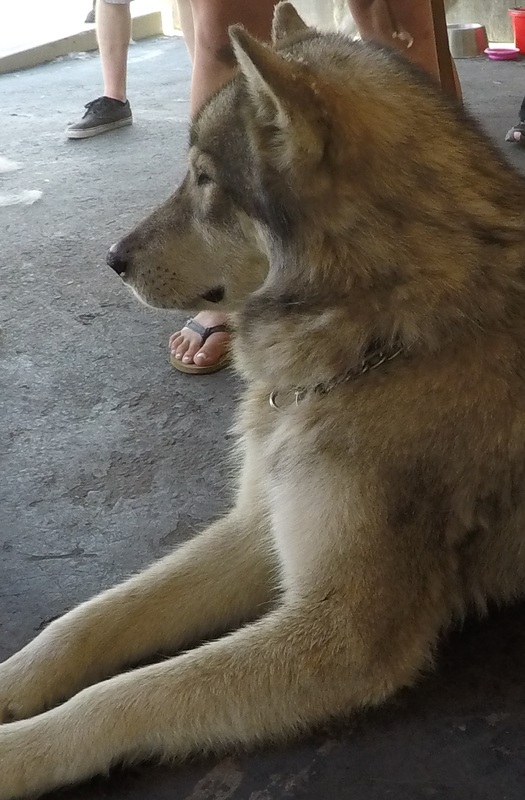 We learn that Hana, the female, is 90+% wolf x German Shepherd, while the larger male is lesser percentage wolf x Malamute. Both are lovely and so friendly. But, as one of the volunteers explains, these animals are friendly and gentle because they have been raised domestically since birth; wolves raised in their native environment are extremely leery of humans. In addition to the thrill of meeting wolves, we taste several of Wolff’s fine wines. We start with their dry Riesling and move on to a few reds, including Syrah, Petite Syrah, and yes! Teroldego. The shaded tables are full of people having a good time, and also enjoying Syrah-infused meatballs. A big crowd at Wolff enjoying the Passport event: wolves, wine, and Syrah-infused meatballs. 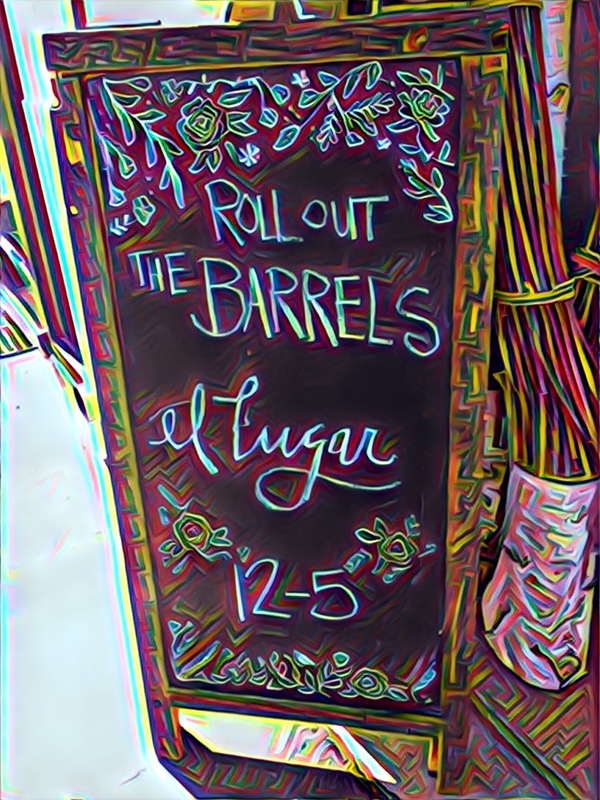 Another winery on the Great Flavors radar is El Lugar, where winemaker Coby Parker-Garcia focuses solely on Pinot Noir. The winery, tucked into a commercial area on Fiero Lane in SLO, is open a handful of weekends a year, and this is one of those weekends. El Lugar’s quiet and welcoming tasting room. What a little jewel box of a tasting room. 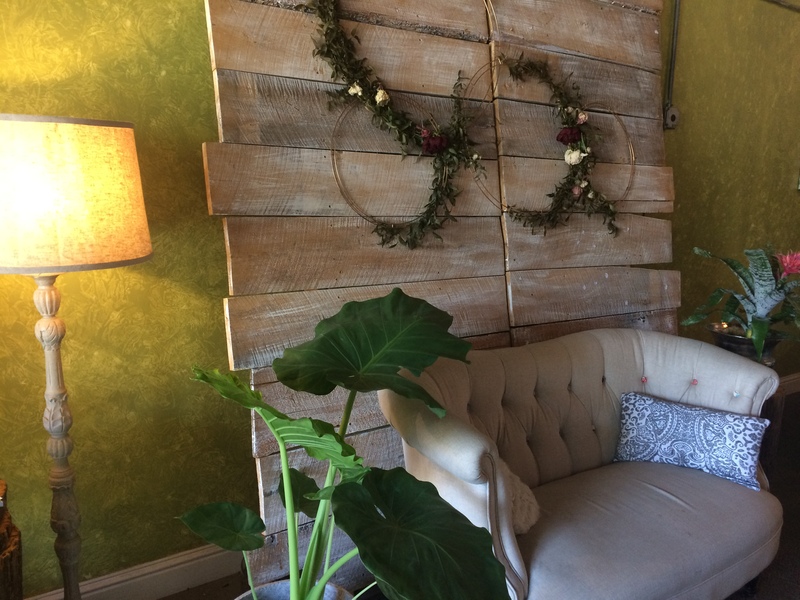 Comfy couches, country touches, and an abundance of restful floral influence—thanks to business partner and wife Katie Noonan’s floral design business—transform the space into the feel of a living room in a friend’s country estate. Beautiful. The El Lugar team: Coby Parker-Garcia and Katie Noonan. The tasting flight starts with a 2016 Pinot Noir Blanc, fermented off the skins, with grapes sourced from Greengate Ranch. Next are two vertical pairings: 2014 and 2015 Pinot Noir from Bien Nacido and Rincon vineyards, respectively. The 2014 from Bien Nacido is paired with a country fig pate from Fromagerie Sophie—magical combination. These are all great wines. What a treat to be able to experience El Lugar, and looking forward to coming back again. 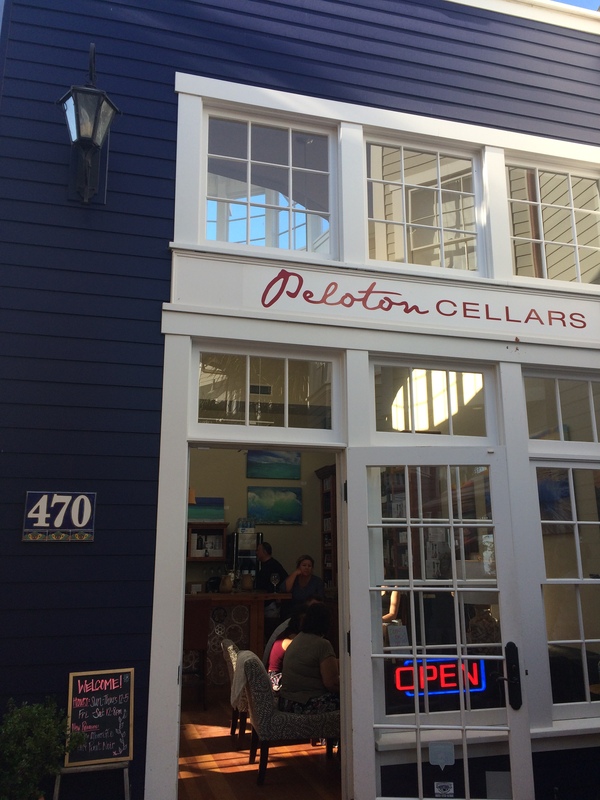 Peloton Cellars in Avila Beach offers great wine with a cycling theme. Drive over to Avila Beach. Cruise around the main streets. If a free parking place opens up within a few minutes, it’s a sign to do wine tasting. If not, it’s a sign to head home. Luckily, a free spot opens up, and Croma Vera and Peloton are open until 7:00. 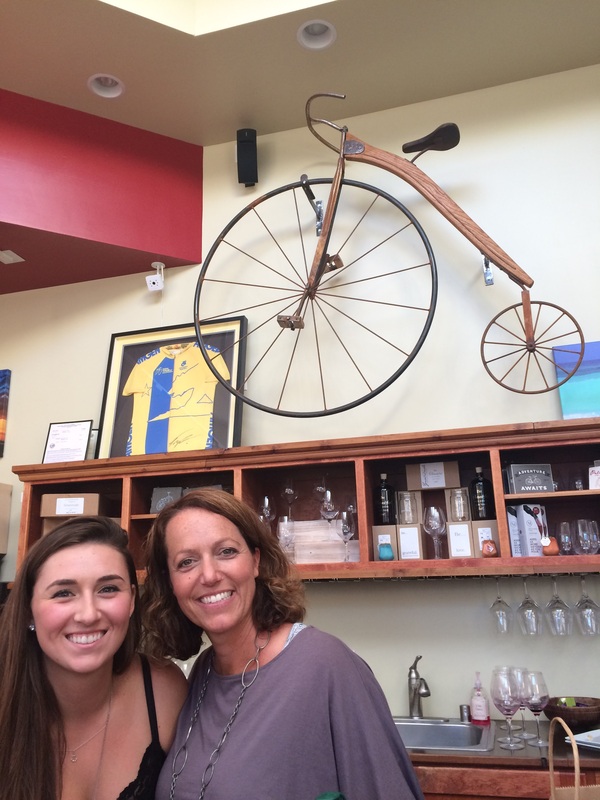 The closest one is Peloton, and the bright blue sea-inspired tasting room is a quiet respite from the noisy Saturday night crowd in downtown Avila. Four friends who love cycling as much as they love wine created the winery. Hence the name: Peloton is French for the main group of riders in a road race. The friendly faces at Peloton, where everyone feels like a winner. The flight starts with a Chardonnay and transitions to a Cabernet Sauvignon, during which time the fun crowd is guessing the number of corks in a wire basket and doing a blind tasting of a red wine. Winners will be announced later. Apparently, I am not a winner with the vino-centered games, but I am feeling like a winner for finding Peloton, the friendly atmosphere, and the great wines they share. Like all great trips, this one must come to an end. And while the event is over, the memories will linger. It’s been a wonderful day of exploring some new wineries, some old favorites, seeing beautiful animals, and spending time with good people. That’s always been the goal of the passport program: to help people try different wines, meet the winemakers, and explore more of the great wineries in our area, from the southern end of the Arroyo Grande Valley AVA to Cambria. And it succeeded. We look forward to next year and exploring even more. How about you? 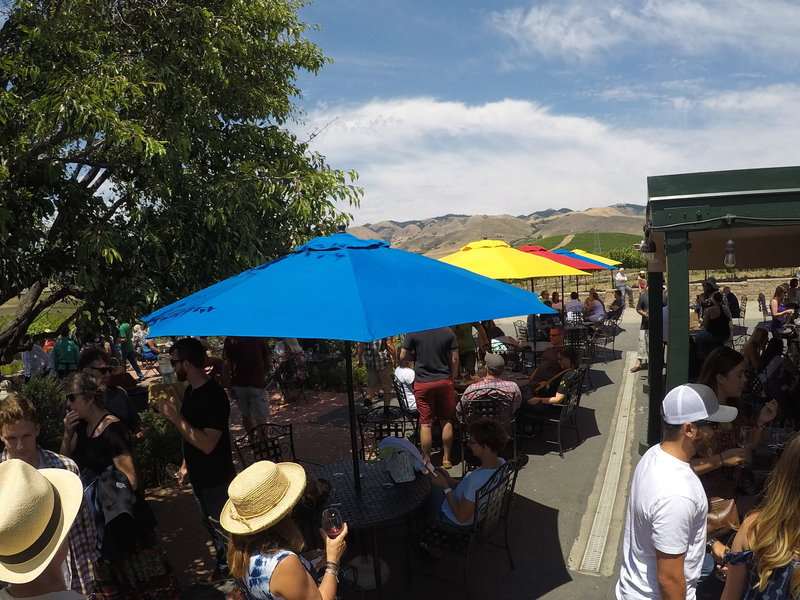 Did you make it out to wineries both days? Did you find a great new winery you hadn’t tried yet? What was the best special feature you experienced? Please do share, either by leaving a comment below or emailing us as engage@gr8flavors.com, and let us know what you thought about the 2017 4×2 Passport to SLO Wine Country.